The Solar irradiance and Earth Radiation Budget (SERB) is a future innovative proof-of-concept nano-satellite, with four ambitious science goals. The nano-satellite aims to measure on the same platform the different components of the Earth radiative budget, the solar energy input and the energy reemitted at the top of the Earth atmosphere, with a particular focus on the UV part of the spectrum and on the ozone layer, which are the most sensitive to solar variability. SERB is proposed for the nano-satellite program of Polytechnic School and CNES for a flight in 2019-2020. SERB is a triple Cubesat, under development by students, mostly working at Polytechnic School. Critical components of instrumental payloads of future large missions (coatings, UV filters, etc.) 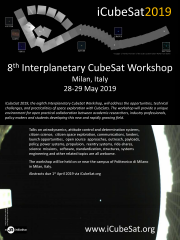 can acquire the technical maturity by flying in a CubeSat. Nano-satellites represent also an excellent alternative of instrumentation testing, providing longer flights than rockets. Moreover, targeted science can be performed by nano-satellites. Thus, this paper is intended to present a future space mission enabled by the development of nano-satellites and the underlying technologies they employ.